Pack/Size: 24/6.8 oz. and 12/6.8 oz. 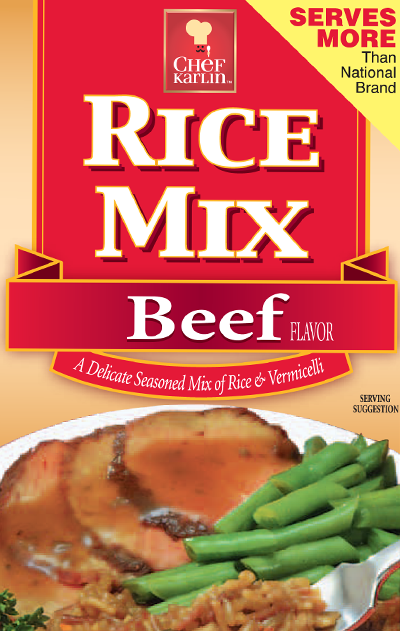 Ingredients: Enriched Rice (Rice, Iron [Ferric Orthophosphate], Niacin, Thiamine Mononitrate, Folic Acid), Enriched Vermicelli (Wheat Flour, Niacin, Iron [Ferrous Sulfate], Thiamine Mononitrate, Riboflavin, Folic Acid), Salt, Enriched Wheat Flour (Niacin, Reduced Iron, Thiamine Mononitrate, Riboflavin, Folic Acid), Hydrolyzed Soy Protein, Onion*, Carrots*, Sugar, Monosodium Glutamate, Caramel (color), Autolyzed Yeast Extract, Citric Acid, Beef Broth*, Garlic*, Chicken Fat, Paprika, Natural Flavor. Slowly add 2¾-cups water and contents of seasoning packet.